I began using professional grade GPS in my work as a field biologist in 2002, then I began using and developing Mobile GIS solutions in 2010. From experience, I can tell you that today is a very exciting time in GPS technology. Gone are the days of trying to convince people that switching from a clunky handheld GPS to a tablet running a GIS app and Bluetooth-connected to an external GPS is easier, more accurate, and more efficient. Nowadays, some of the most popular and largely attended talks at professional conferences are those discussing Mobile GIS hardware or software. Whether you are looking to set up a new Mobile GIS solution, or if you’re already using Mobile GIS, there are a few things to keep in mind about your hardware to be sure you are using the best equipment and workflow for your needs. All these components come down to first understanding what a GPS receiver is really doing for you and how it works in concert with the navigation satellites overhead. This article will break down the nitty-gritty of today’s GPS equipment and how to use the newest Bluetooth-enabled GPS receivers with your phone or tablet to get the best out of your Mobile GIS field data collection. Until about ten years ago, there was only one constellation of satellites serving GPS receivers. In the 2000s, many of us were using professional-grade GPS handheld receivers that were only utilizing information from the GPS satellite constellation. This made work difficult because there were times of the day when there were too few satellites in view to get a decent fix on our position even when we were standing in a wide open space. 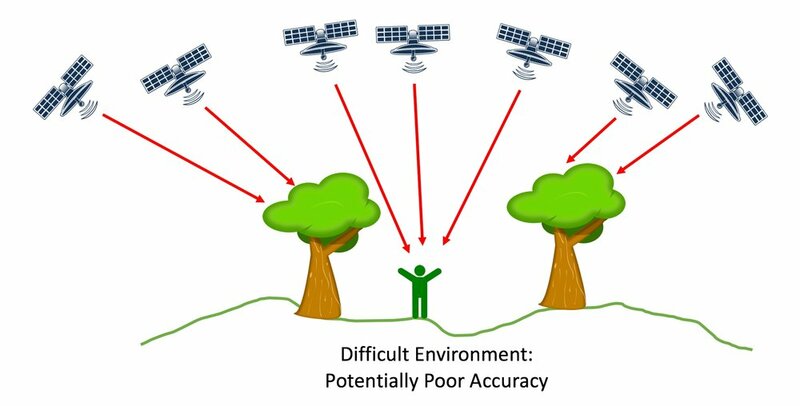 This is important because satellite technology and GPS receivers work in a line-of-sight method where any type of physical object, such as a building or tree canopy, can block the weak satellite signal, as shown in figure 1. Figure 1. How satellite technology works via line-of-sight because of the weak satellite signal strength. I remember well the difficulties of not having enough satellites at a given time of day to “accurately” acquire my position in the early 2000s. Heck, even in 2008, with very expensive professional-grade GPS receivers, it was not uncommon to just stop mapping for an hour or two every day because the position of the GPS satellites overhead were not “optimal.” In addition, working under tree canopy was abysmal since trees and other objects are obstructions that can cause satellite signals to bounce around and create positional error called multi-path error. In those days, we were obsessed with PDOP (position dilution of precision) values. PDOP values are based on the geometry of the satellites locations over the GPS user and the resulting positional accuracy (read more about PDOP here). Back then the early receivers didn’t have a robust method for determining an estimated accuracy for the user on the fly like today’s equipment does. What started as just the U.S. GPS satellite system has grown into multiple constellations of navigational satellites operated by various countries. First, the Russians opened their Glonass navigational satellite constellation to the public and we could buy new receivers with the ability to track both the GPS and Glonass satellites. This was a boon to field users as it nearly doubled the number of available satellites at any givin time. This provided us with a more robust system and greater levels of accuracy. This inevitably led to new terminology to differentiate between receivers that could only track GPS satellites and those that could track both GPS and Glonass simultaneously. Thus, we began referring to these receivers as GNSS (Global Navigation Satellite Systems). Nowadays, the best GNSS receivers can simultaneously utilize GPS, Glonass, Galileo (European), BeiDou (Chinese), and other satellites, which translates to a greater number of satellites available for determining the position of the user. Ultimately, having more satellites available results in a faster fix-time to acquire a more accurate position. This is especially helpful in difficult environments that may have reduced sky visibility, such as working in forested or urban areas with lots of trees or buildings. A common misconception today is that your cellular phone has an internal GPS, and it can do what you need to complete your daily work routine of mapping new features and navigating to existing ones. That is sadly not accurate. Yes, your fancy smartphone does have a GPS circuit board in it; but it is a very inexpensive board and is not connected to any substantial antenna. I tested the accuracy of cellular phones, iPads, and consumer-grade GPS receivers a few years back, and their performance is quite poor. With that said, it is exciting to see that many smartphones in 2018 (including the iPhone X) will be equipped with Broadcom chips that will automatically and simultaneously tap into most of the available navigational satellites, including Galileo, GPS, Glonass, BeiDou, and Japan’s QZSS. So, advances continue to move forward on that front. By default, your smartphone is determining your position based on cell tower triangulation and not using its internal GNSS. The cell phone will not use its poor GNSS receiver unless you manually inactivate cellular service on your phone. Thus, if you are outside of a metropolitan area, there are few cell towers to triangulate your position and you could be looking at positional error in the range of 15 meters or more. Thus, you should really be pairing your phone or tablet with an external GNSS receiver to increase the accuracy of your positioning. This is especially true if you are mapping features or assets that field users will have to navigate back to in the future. For example, if you map an asset with a consumer-grade GNSS with 3-meter accuracy and then return with that same accuracy, the repeat visit could show you are standing on the asset but in reality, the asset could be anywhere in a 20+ square meter area around you. So, the major question is: What accuracy is required for your work? Or, more likely: What level of inaccuracy is acceptable for your work? Figure 2 illustrates the different levels of accuracy that Bluetooth-enabled GNSS receivers are capable of providing to your phone or tablet. These receivers range from consumer-grade all the way down to professional levels of accuracy in the centimeter range. All these different receiver grades provide this level of accuracy in real-time, but via different methods. The least expensive receivers utilize the Satellite Based Augmentation System (SBAS) of corrections. In North America, the three SBAS satellites that always stay positioned overhead are known as the Wide Area Augmentation System (WAAS). Figure 2. Visual representation of GNSS accuracy based on receiver category. Currently, the highest level of accuracy Bluetooth GNSS receivers can provide to our phones and tablets is centimeter-level via Real-Time Kinematics (RTK) technology. The differences between WAAS corrections and RTK corrections are described in another of my articles here. The basic message is that you can now map your data within a few centimeters of accuracy for the same price as (or less than) that old-school submeter accuracy handheld GNSS device running Windows Mobile and clunky software. A complete Mobile GIS solution consists of the data collector (a phone or tablet), a GIS app running on the data collector, and a GNSS receiver Bluetooth connected to the data collector. I will share my personal view on equipment based on my experience, and then you can make your own decisions based on your own needs and preferences. Phone, tablet, or laptop? With today’s Mobile GIS apps, the days of carrying a laptop in the field are thankfully over. It is likely that your field crew is completely accustomed to their smartphone’s interface, so now the question is really between phone or tablet. Some people prefer the larger screen size of the tablet while others prefer the small convenience of the phone. I personally prefer the larger tablet screen due to the fact that many Mobile GIS apps must compress menus and group things together when displayed on phone screens. Plus, the whole advantage of going mobile is getting a color screen that is larger than the clunky gray screen on that old handheld GNSS! Until the last few years, the decision of which mobile operating system (OS) to go with (iOS, Android, Windows 10) on the data collector largely depended on what specific GIS app and what GNSS receiver brand the user preferred. Nowadays most of the “better” apps are available on both iOS and Android, so it becomes more of a focus on the GNSS receiver model (huge differences in quality out there) and personal preference for OS. As for the tablet OS, the two main competitors are obviously Apple’s iOS and Android. Early on, iOS was the easy choice because there were more apps available for field work. Not just GIS apps, but also plant and animal field guides, camera apps, tracking apps, and more. This is less of an issue in 2017 as the Android options have expanded. The other issue in the past was cost. It used to be less expensive to buy an Android tablet than an iPad but now Apple has released a lower-priced iPad in the same price range as the lower-priced Android tablets. A very important issue still relevant today is the security issue between operating systems. Apple’s apps are tightly monitored and I trust any app from their store. However, Android’s app store is the Wild Wild West and literally any app you download could have a malicious bug in it because Google doesn’t do the same level of security control as Apple. Another main component to device choice is ruggedness. Rugged handheld makers and their rugged Windows 10 tablets win out over iOS and Android. I am referring to those Windows 10 tablets that have been made by rugged handheld/tablet manufacturers for years now, and not the Microsoft Surface. I personally would never use the fragile Surface in the field because I can’t ruggedize it with a tough case. Unfortunately for Windows 10, this OS offers few of the conveniences and the multitude of apps seen in iOS and Android. My preference is to go with the all-metal body construction of the iPad and a LifeProof waterproof case. I have had rental clients use our ruggedized iPads in every environment imaginable across North America for the last four years and they have all returned in good working order. I prefer iPads not only for the obvious reason of ruggedizing capabilities, but also the fact that iOS is more regulated and secure for users downloading apps. Users need to put some serious thought into their app needs before investing in a solution. There are a lot of apps that are very good at specific things, and some of the bigger names out there are Esri’s Collector, Croptrak, PDF Maps, and Fulcrum. There really is no perfect master app for every field need, and some GNSS manufacturers make software that comes with their receivers (more on that below). However, in my experience, companies that only make software tend to make better GIS apps. Ultimately, it is important to keep in mind that an app that works for one type of data collection may not be the best app for another type of application. For example, a great app for a forester is not necessarily going to be the best app for an electric utility company. The app I prefer for mapping high-accuracy positions is admittedly a terrible app for collecting complicated electronic data forms. On the flip-side, my favorite app for collecting extremely complicated data forms (like wetland delineations), is actually not great at high-accuracy mapping. Ultimately, you just have to weigh the most important features to you and then decide which app best suits your needs. If you do a wide variety of field surveys, then it might just take two apps to get all your field work done. The best Bluetooth GNSS receivers today can utilize all the available satellite constellations simultaneously. See figure 3 for just one example. The most exciting of these new constellations is the European Galileo system. When fully active in 2020, Galileo will have 30 brand new high-quality satellites circumnavigating the globe. By comparison, the GPS constellation has about 33 satellites and Glonass has 24 satellites. The Galileo satellites will also have higher quality components than the current Glonass satellites. Figure 3. An example of a submeter GNSS receiver capable of tracking four satellite constellations. It is important to note that while some GNSS receivers state they can use all four constellations, they may only actually use two constellations simultaneously. I recommend reading the fine print on those GNSS receiver specification sheets carefully. After the GNSS receiver’s ability to track multiple constellations, there are really two aspects of choosing your GNSS receiver to work with your data collector and GIS app: 1) mapping accuracy required, and 2) OS compatibility. The question of accuracy is a relatively easy one and depends on your data requirements, as mentioned above. Don’t assume the handheld GNSS maker you have always used in the past makes the best Bluetooth GNSS receiver for your current needs. The OS compatibility comes into play here. Some receivers can only use Android or Windows. There are relatively few receivers that can interface with all operating systems. I have even bought an expensive receiver from a major manufacturer that claimed it worked with all OS options only to find out after a lot of frustrating troubleshooting and multiple phone calls with their Help Desk that it only worked with Android. After OS compatibility, there are two general categories of Bluetooth GNSS manufacturers: 1) manufacturers that make proprietary software and want you to buy and use it, and 2) agnostic manufacturers that don’t make software and don’t care what software you use. If you want to use a GNSS receiver that comes with its own proprietary data collection software, then your choice is easy - use their complete system. However, if you want the flexibility of picking your own software and OS, then go with an agnostic GNSS manufacturer. The receivers from agnostic manufacturers always seem to integrate better with independent software maker’s apps. I recommend going with an agnostic GNSS manufacturer because it gives you greater flexibility in choosing your OS, tablet model, and your GIS app. With all the advances in GNSS technology and the variety of receivers available, it has never been easier, cheaper, or more efficient to collect field data or electronically monitor field assets in real time. In comparison to ten years ago, there are approximately three times more navigational satellites in the sky, data collection apps have gone mobile and gotten simpler, and GNSS receivers have become more robust. Today’s field users have an easier time learning how to use these hardware and software systems since they mimic their own smartphones. With all of these options you can now buy GNSS receivers that will work with your tablet for less than you can buy a submeter handheld GNSS unit running Windows 10 and its limited software options. It is now up to each user to decide which data collector, GNSS receiver, and GIS app best fits their needs. The dark ages of GPS are over, and the future has never looked brighter.